“Nothing” does not exist. Only “something” exists. owes its existence either to nothing or to something. There is, then, a something, which is either one or many. If many, the beings would be mutually dependent for their own existence or dependent on another. They cannot be mutually dependent for their existence. Something cannot exist through a being on which it confers existence. Therefore, there must be one being through which all other beings exist. This being must exist through itself. Whatever exists through itself, exists in the highest degree of all. Others have developed the idea in different ways, but hopefully you get it. I personally think the argument is one of the best things apologists have in their dialogue with the culture about the existence of God. 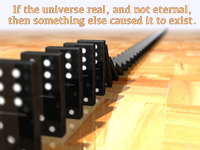 The argument certainly is not a proof for the existence of God, or more particularly for the existence of YHWH as the creator-God, but it certainly is a way of confronting the present-day idea that something can exist without a cause, or that nothing can produce something. In that sense, the word “god” (on the front end of the debate) could be replaced with “first cause” and move forward from there. I personally have used the argument many times to help non-believers assess their own belief that the universe is a random, meaningless, chaotic result of nothing becoming something, and that something evolved into humans who could think about the meaninglessness of their own existence. How about you? How have you engaged in discussion about God’s existence? What have you found most helpful and most difficult? Read more in Geisler, N. L. (1999). Cosmological Argument: In Baker encyclopedia of Christian apologetics. Grand Rapids, MI: Baker Books.